Merry and Bright! 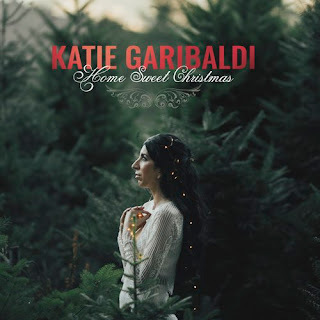 : Artist Interview: Katie Garibaldi "Home Sweet Christmas"
Artist Interview: Katie Garibaldi "Home Sweet Christmas"
On Friday December 1, Katie Garibaldi's "Home Sweet Christmas" will be released, following her excellent 2016 single "Tomorrow is Christmas Morning" (reviewed here), which gave us an inkling of what was to come from this talented musician. 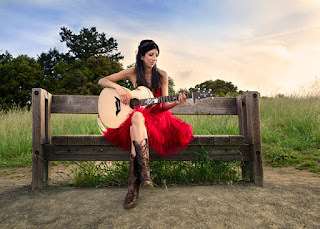 Katie calls the San Francisco, CA bay area her home, and is a well-established singer/songwriter/guitar player, with four previous albums and an EP in her catalog. 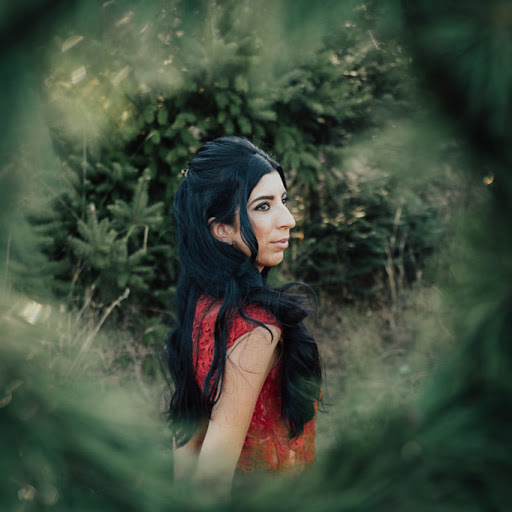 Recently her award winning video for her song "Delightful" has been garnering attention and positive reviews across the music and film industries. I mean, check out the props for "Delightful" on Katie's video page. Katie graciously agreed to chat with us about her album, her musical influences, Christmas in San Francisco, and a few other things. Just as her album is a musical extension of herself, Katie's interview is very open, expressive, and is bursting with excitement about "Home Sweet Christmas", I hope you'll agree that through the interview, Katie really allows you to get to know her as an artist and a person. Merry and Bright: Hello Katie! Thank you for chatting with us about your new record ‘Home Sweet Christmas”. Katie Garibaldi: It’s my pleasure! Thanks for your support. MB: You had released “Tomorrow is Christmas Morning” last year as a single, and as a little taste of what was to come with the album this year. How long has this album been in the works? KG: I’ve always wanted to write a Christmas album, ever since I was a kid. I think holiday themed songs are really special, but I never wanted to record a Christmas album just for the sake of selling one—I wanted it to be sincere. When I wrote “Tomorrow is Christmas Morning” last year, I knew that the holiday muse had finally found me, so to speak. I’m really proud of that song because it came from an honest place, being on tour missing my husband and wanting to come back home. I think “Tomorrow” gave me some confidence in myself that I sort of proved to myself that I could write Christmas music with my own voice and perspective. So initially I thought I’d work on a holiday album and do half original songs and half classics. But ever since last Fall after I wrote “Tomorrow,” every time I picked up the guitar I just kept writing Christmas themed or faith based music. So when song after song kept coming to me, it was just a natural progression to decide that I was going to do an all originals Christmas album. I added “Silent Night” as a sort of bonus track for somewhat sentimental reasons since that’s been my favorite Christmas song forever and I’ve always wanted to record it with a string arrangement. MB: “Home Sweet Christmas” has a very personal feel to it, especially with eleven original songs and only one traditional Christmas carol. Can you tell us about your creative process to turn your ideas and inspirations into songs? KG: A lot of the songs are definitely very personal. The creative process was different for each song and kind of all over the map. For some of the songs I sat with my guitar and found the chord structure first, and then the melody and lyrics would follow. But I never once planned to write a Christmas themed song. I just let the inspiration find me and often to my surprise, holiday based stories would be coming out of my mouth as I found my way through the lyrics. I would say to myself, “Well, ok then, looks like we’re writing another Christmas song!” But I found that a lot of times with this album I would come up with melodies and lyrics, sometimes almost for a complete song, without picking up the guitar at all yet. So I would think of it in the car or walking and then quickly record my ideas on my phone. Then it was a bit of a challenge for me to find the right chords on my guitar to match the song, but it was a very creatively lush process and I think that inspired different styles of writing for me that I hadn't explored much in the past, like the love I have for gospel music. That’s exactly how it happened with the song “Jesus Touched My Heart.” I wrote the entire song in my head first before learning the guitar part. It was a lot of fun actually. I let the songs find me without letting the guitar dictate anything prior. So in a way, there was more freedom with writing this album than other albums, and that just happened naturally. As far as turning ideas into songs, each one is different but once I got the initial start of a song rolling, the rest would fall into place. For example, “Holy Spirit in My Heart” started out as a regular song and not a Christmas song. I was inspired after reading the “Joy Comes With the Morning” Psalm 30 from the Bible and the song I was writing was more just in general about every day being a new day and even though today you might be crying, tomorrow there will be joy. So it’s a song of hope. But then the lyrics turned into writing about Christmas day, without actually saying the words “Christmas day.” So it’s a song about having faith and believing in that faith, and then I just followed the songwriting process, which naturally led it down a path of becoming a Christmas themed song. MB: Several songs, including “Star in the East”, “Wonderful Mother Mary”, and “Safe and Warm” are very spiritual. Are these a reflection of your upbringing that you’ve channeled into your music through these songs? KG: Yes, I think so. My relationship with God has always been very personal to me, like a friendship that no one else would fully understand. My songwriting is very much the same way. It’s me and my guitar and God. And I’ve always felt that the quickest way I can get in touch with God is through my music and singing. It’s fun to celebrate the Christmas holiday with all its festivities like Santa Claus coming to town and I love all that stuff. But for me personally, Christmas at the core is about celebrating the birth of Christ and that’s the faith I grew up in. I actually wrote “Star in the East” when I was a kid, maybe 12 or 13 years old. I put it away but always remembered the song and thought if I ever make a Christmas album, this will belong on there. So I did just that. “Wonderful Mother Mary” and “Safe and Warm” are new songs and I was really happy to find a place for them on this album because maybe I could have written some song about the North Pole or something, but these songs came from a deep place in my heart and turned out to be very personal and honest. So yes, this is a Christmas album, but it’s not just a Christmas album for the sake of being a Christmas album. I kind of just think of it as my newest album that happens to have soulful and holiday based themes. I’ve written songs about faith before, but being so open about spirituality through my music is definitely a new thing for me and seemed appropriate for this album. It feels really good to be able to sing openly about my faith. MB: A couple of the songs, “Happy Married Christmas” and “Tomorrow is Christmas Morning” touch on themes that are pretty original, even in the vast canon of Christmas songs – the first Christmas as a married couple and the special mystique of Christmas morning. I personally love songs that find a new niche and are done very well, as these are. Were you striving for an original spin on the holiday season when you wrote these? KG: Thank you! “Happy Married Christmas” all started with a melody and the lyrics “home is wherever you are.” My guitar took the lead on manifesting the rest of the song. I didn’t intend for it to be a Christmas song, but then I think the next lyrics that came to me after that were “The holidays feel new since we said ‘I do.’” So it just all formed from there. I tend to just let whatever story is meant to find me come and then I’ll have an exciting moment like, “Oh this is what this song is going to be about. Got it. Ok, let’s go!” and then I’ll start putting more conscious thought into it after that. When my husband and I got married five years ago, it was really exciting to spend our first married Christmas together and since then, we’ve been continuing to make our own traditions and get used to the holidays as a union. It’s a really special feeling and when the theme of the story became clear, I was glad to capture that moment with this song. I wrote “Tomorrow is Christmas Morning” last September while I was on tour in Nashville. I was in my hotel room playing guitar and the chord progression came to me first. Once I had the melody, the words started forming. But again, I had no intention of sitting down to write a Christmas song. It just happened. It’s a bit difficult to describe where initial creativity comes from. I guess that goes back to my spirituality because the process is much like just being an open vessel to allow whatever inspiration that's meant for me to come in. But once I had the beginnings of the words and story, I started to create visuals like, “You’ll wake up next to a pretty tree that’s dressed in all our memories and I’ll open my eyes to this hotel room without you next to me.” That all came from a real place since I was in a hotel room missing my husband. But trying to make it home in time for Christmas morning put a different spin on it. MB: Now, “The Times I Love the Most” is just downright fun. It’s a head-boppin’, toe-tappin’, California sunny smile of a song. (It actually reminds me a lot of my brother-in-law and sister-in-law that live in Half Moon Bay, CA). Can you tell us a little bit about it? KG: Thanks! Last year I was on tour in December to promote my “Tomorrow is Christmas Morning” single and I drove down the coast from the San Francisco Bay Area to the Central Coast and Los Angeles. As I was driving, I kept humming this melody and then pretty soon the lyrics “Let’s take a drive on down the coast…these are the times I love the most” came to me. I recorded my ideas and then later on when I was back home I applied the guitar to the melody ideas and the song “The Times I Love the Most (California Christmas)” formed. The song is a fun account about everyone heading to the snow and the cold for the holidays, but I’m just fine taking a road trip and spending Christmas on the beach in the sun. It’s all about making your own traditions. So the lyrics were initially inspired by a real experience, and then I added in the love story component to the song as well. I wanted the production of the song to be very “surfy” so we added these wipeout style drums in the bridge section and of course the surf guitar style pedal steel. MB: The musicians that accompany you on the album are great! And it’s your Mom on piano on “Silent Night”, right? Can you share some thoughts about your band? KG: Yes! I’ve known the drummer, Todd Richardson and bassist, Kevin Blair for years now and I really fell in love with their playing from the start. They’re not only amazing players, but they’re very thoughtful in creating parts that complement the stories in my songs and they understand what I’m looking for, even when I have a difficult time sometimes trying to articulate what I’m hearing in my head. They just nail it. Kevin reads my mind and hits notes sometimes that inspire me to accentuate my vocals, and Todd is fun to watch at work because he gets really excited about adding in sometimes the smallest elements, like for example, a different snare drum because the vibe fits the lyrics better, which I just love. We recorded our parts together live in the studio in one weekend. I would be remiss not to mention engineer Justin Weis too. He is absolutely incredible and was a big part in constructing the sonic vibes on this album. I’m not immediately comfortable in the studio just because it’s a bit out of the ordinary and a completely different element than songwriting or performing. It’s a whole other world and sometimes takes me time to settle into. But Justin made me feel so comfortable right from the start just by being great at his job and really laid back and fun to work with. He made everything really easy. Sometimes I think as an artist you can overthink things in the studio with all the decisions you have to make but music is supposed to be fun, and this album was literally just fun to make. We had a good time. After we recorded the rhythm tracks, I overdubbed my parts and then brought in the additional musicians, including the lovely Jon Mitguard on pedal steel, the string section, keyboards, and the backup singers (my Christmas choir!). They all did a fantastic job. And yes, my mom is playing the piano on “Silent Night.” From the beginning I knew I wanted to get her on the album because Christmastime reminds me of home and family and I grew up singing Christmas songs while my mom played piano. That’s where it all started for me, so it really means a lot to me that she’s on there. MB: I always like to know more about the musical influences of the artists creating these great new Christmas records. Who are some of the musicians that have inspired you? KG: As a kid, my parents played a lot of classic rock and roll and pop records, like the Beatles, the Beach Boys and Michael Jackson and the Jackson 5. I think that’s where I got my love of melody from. When I started getting into current music, I loved pop singers like Mariah Carey and Celine Dion. Then when I learned the guitar around age 11, that was about the same time Jewel made it big with her debut album and she was a really strong influence for me. I think she inspired me a lot to be honest in my songwriting and find my own voice. After that I got really into country music, starting with more contemporary artists like Shania Twain and the Dixie Chicks and then going backwards in time to discover and appreciate the greats like Hank Williams and Patsy Cline. MB: What are some of the Bay Area holiday highlights, some of the best Christmas-related things San Francisco has to offer? KG: They just had the annual holiday tree lighting at Union Square in San Francisco, which is a really pretty area where a lot of people go to do their Christmas shopping. There’s also a tree lighting for a Christmas tree at Pier 39. That’s a big tourist attraction and fun place to visit if you’ve never been. And there’s a really cute thing called The Wishing Tree in San Francisco. You can go visit it and put your wish on a tag and put it in a jar. Then your wish will be added to the lit up tree. The idea is that something magical happens when people collectively wish and express gratitude in one single place. Otherwise off the top of my head, I would say Christmas tree farms are pretty fun to visit in the Bay Area. 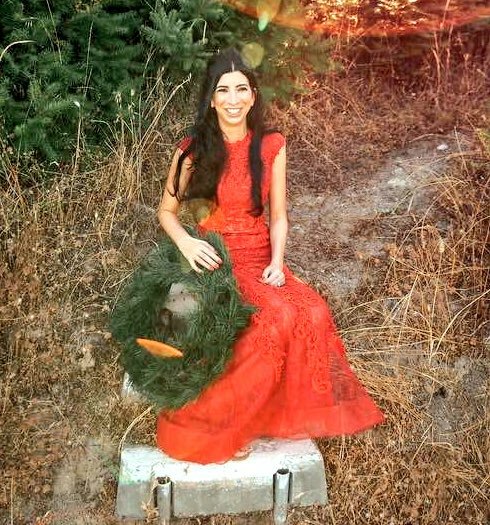 I did the photoshoot for Home Sweet Christmas at the Black Road Christmas Tree Farm in Los Gatos back in the summertime and it’s gorgeous, and huge! It’s definitely a great place to visit to get into the holiday spirit. MB: Katie, we live in some difficult and troubling times in our nation. When I listen to “Home Sweet Christmas”, I hear songs of unity and peace, and a love for home and family. Is there a message you’d like to share with your long-time fans as well as those who will experience your music for the first time with this record? KG: That’s very sweet of you to say. To me, Christmas music always puts me in a good mood and it has this interesting way of hushing the clutter in my mind and just placing me in the present to appreciate the moment. So my hope was to create an album that no matter what time of year people listen to it, whether it’s the holiday season or some other month, they’ll be able to enjoy it and feel a sense of coming back home. It kind of seems like another lifetime when I think about being a little kid and singing songs for my family on Christmas. But that’s part of who I am and those moments sort of stuck with me like snapshots in my mind of family, home, faith, and love. I think those things really came forward in these songs. During the holidays people tend to be a little bit kinder and a little bit more giving. People don’t think twice about opening the door for someone or smiling to a stranger. (Well, for the most part, haha!) When we take care of each other in those small but significant ways, we’re reminded that we’re never alone. I think music has the same kind of magic. It speaks a truth to us that we all go through the same things, so we might as well have peace of mind about it enjoy the ride. With all the hustle and bustle of the holidays, maybe it can be easy to lose sight of what really matters. When people hear Home Sweet Christmas, hopefully it reminds them to feel happy and grateful. MB: You have a wonderful album, Katie. I hope it is very successful for you, and perhaps we’ll hear more Christmas songs from you in years to come. I’d like to thank you again for spending time with us at Merry & Bright. Have a very Merry Christmas Katie! KG: Thank you so much! I really appreciate your interest and kind words. And I’m hopeful to write more Christmas songs in the future for sure. Merry Christmas and have a wonderful holiday! The author purchased "Home Sweet Christmas" from the artist for his personal Christmas music collection. The artist provided a pre-release private stream for early review purposes. The beer selection at this place was great and rotates often. Everyone who works at San Francisco event venues makes you feel welcome. They remember your favorite drink and you will be glad to tweet about them. You're amazing Katie! Keep up the hard work for the Holiday CD, Home Sweet Christmas. This also a beautiful review, and you're the BEST KATIE!! NOT for Spring, Summer, or Fall. Or Autumn. Dig this Start to the Sharing Season!